Roanoke Fire EMS Department Recruit Class #15 celebrates 10 years today March 1, 2009. We began recruit school on March 1, 1999. It is hard to believe that it has been 10 years on the job. 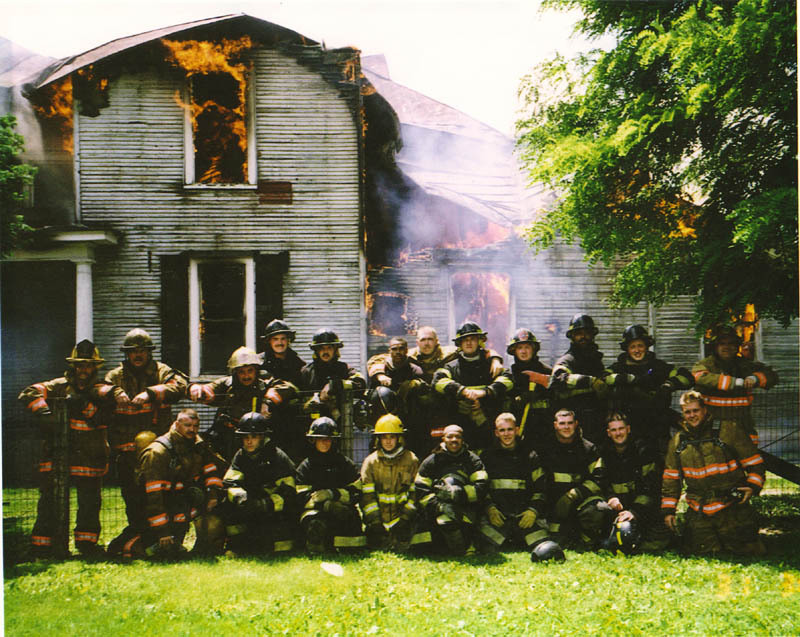 Right to left front row: Captain Phil Dillon*, FF Todd Reighley, Beth Norwood, FF Betty Totten (Salem), B.T. Butler, Lt. Rhett Fleitz, Lt. Kelcey Branch, FF Barry Kincer, Battalion Chief Roger Manuel*, Captain R.T. Flora*, ? *, Captain Chris Trussler*, Lt. Jeremy Bennington, 1st Lt. Doug Hurd, Sport Hayden, Lt. Travis Simmons, Lt. Mac Craft, Dennis Duncan, Charles Williams, Lt. Kevin Bradbury, 1st. Lt. Brian Riddle*. An asterisks (*) indicates an instructor and I cannot figure out who is next to Captain Flora. All individuals are notated with their current rank/position. No rank/position indicates that the person no longer works for Roanoke City. All of the individuals were hired by Roanoke Fire EMS with the exception of Betty Totten who works for Salem. Where are they now? Let me give you a rundown of where the ones who left are now for the ones I know. Beth Norwood married Roanoke FF/PM Rob Joyner and I believe is an RN. B.T. Butler works for TSA at the Roanoke Regional Airport. Sport Hayden works for the Henrico Division of Fire in Henrico County, VA.
Dennis Duncan is in school to become a Physicians Assistant (PA). Charles Williams left the department. Congratulations to all who are still here and best wishes to all those who have left. Most of them still keep in touch. Our class was 6 days a week for 12 weeks. It was held at the old Administration at the Jefferson center. Most of our PT was done at Victory Stadium. It sucked but we had a blast. BC Manuel was the 1st Lt. of Training at the time and Capt. Dillon was the Lt. in training at the time. 1st Lt. Riddle and 1st Lt. Plaza were in training at the time as well and Crosby Grindle was the BC of Training. Awww, I see my Poppy!! !